Are they really soft wheels that won't scratch floors? Because they look no difference from hard plastic wheels currently on my chairs. Yes, they are really soft wheels that won't scratch floors. It's hard to tell soft or hard plastic wheels just by appearance. It should depend on their material. The hardness of polyurethane (PU) is less than hardwood, and we use PU for the outer layer of wheels, so these wheels won't scratch hardwood floors. Is it possible to buy chair casters which are totally made of soft plastic ? No. No matter what type of office chair casters, they must use hard plastic such as nylon or Polypropylene (PP) for wheel body. It's just like the spoke wheel in bicycle wheels, which is related with capacity to support weight. So it will be unable to support chair's weight if casters which are totally made of soft plastic. If all PU soft wheels are safe to hardwood floors, why should I choose your products ? Although most of soft wheels are similar, the difference is the way to make wheels. Most of PU soft wheels are made by traditional plastic injection way, but the PU layer of wheels will be easily come off after used for 2~3 years. However, all PU chair wheels of ENJOY CASTER are made by new patent plastic injection way, which will greatly improve the adhesion between nylon body and PU layer, that's why we dare to provide 5-year warranty. 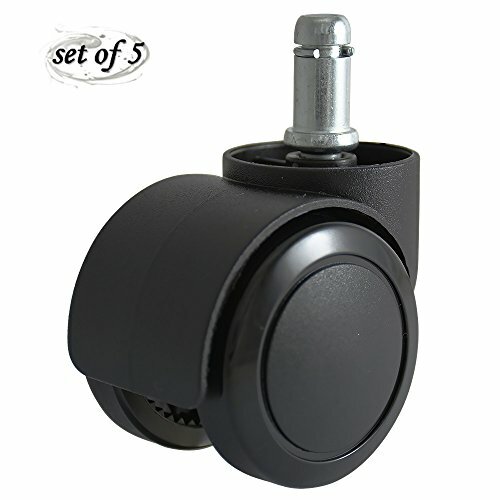 SAFE FOR ALL FLOORS - SET OF 5 - wheel diameter of 2 inches (50mm) Polyurethane(PU) soft plastic office chair wheels. Not scratch hardwood floors and safe for all kind of floorings. UNIVERSAL GRIP RING STEM SIZE: 7/16" (Φ11mm) width X 7/8" (22mm) length, fit most office chairs. Not compatible with Ikea chairs. Please make sure your shaft size firstly. 5-YEAR WARRANTY - all of our PU casters are tested to SGS and BIFMA standard and also passed EN12529 / EN1335.2 standard. Smoothly & Quietly Rolling: Twin wheel design & lubricated with totally new grease -- make sure smoothly and quietly rolling and won't disturb anyone around you. HEAVY DUTY LOAD CAPACITY: 550lbs (250kgs) each set. All products from ENJOY CASTER made by ANSI/BIFMA X5.11 Large Occupant Office Chair Safety Standard. EASY TO INSTALL - just pull out your old casters and push in our soft casters into the stem hole. If you have any questions about this product by ENJOY CASTER, contact us by completing and submitting the form below. If you are looking for a specif part number, please include it with your message.